Hamburg gets new sensor network for digital parking management. The smartphone application shows free downtown parking facilities. Users can pay for the parking ticket with their cell phone, thus saving a trip to the pay station. Deutsche Telekom is now rolling out a new sensor network for this digital parking service. This month Deutsche Telekom started installing sensors on parking spaces in downtown Hamburg. Using innovative wireless technology, the sensors provide information on free parking spaces. The first 100 connected parking sensors are now being installed in the Wandsbek district, with up to 11,000 sensors planned in the entire Hamburg downtown area through the end of 2019. “Residents and the city administration benefit from digital services such as our parking app. We spend an average 20 minutes looking for a parking space. This clogs up roads and increases exhaust emissions in the city center. Here we aim to provide a solution with Park and Joy. 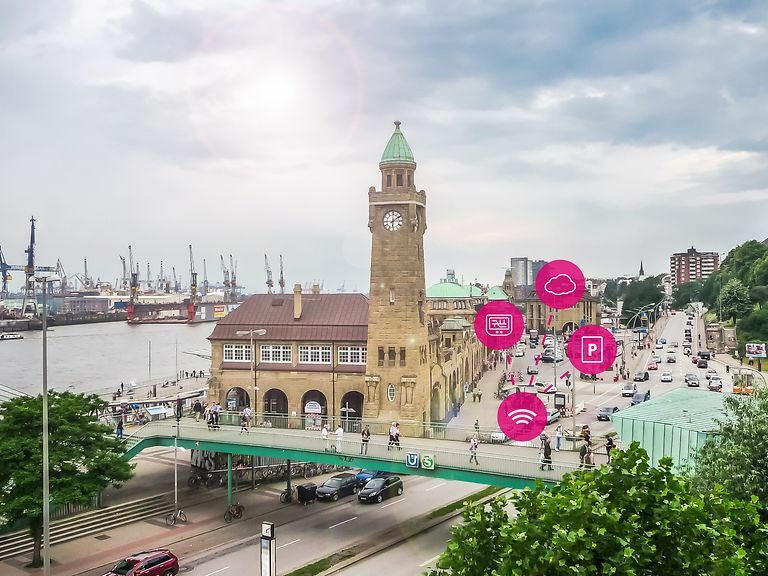 We are delighted to use in Hamburg our new parking sensor network extensively for the first time,” says Oliver Bahns, head of Connected Mobility at T-Systems, adding: “Other major cities are also set to benefit from the new service. The aim is to make the app usable throughout Germany.” Cities looking to roll out the digital parking management system this year in conjunction with Deutsche Telekom include Bonn, Darmstadt, Dortmund, Duisburg, Hagen and Moers. The Park and Joy app has been available in the app stores since last fall. Since then it has been used for billing parking by the minute in Hamburg. The new Parking Space (P) app function was added in early 2018. The P function in Park and Joy highlights those areas in gray where you are likely to find a parking space near your destination. Various data sources, such as anonymized Deutsche Telekom network usage data, weather or calendar data are fed into the prediction. To provide a high-quality prediction, Deutsche Telekom is installing parking sensors which send information on parking space occupancy via narrowband radio technology, the so-called Narrowband Internet of Things network. The information from the parking sensors should be incorporated into the system before the end of this summer, making it even easier and more accurate to find a free parking space. Sensors for NB-IoT use minimal amounts of power yet have a long range.